Blazars are a composite class, consisting of BL Lacertae type objects (BL Lacs) and Flat Spectrum Radio Quasars (FSRQs). They are differentiated by the presence (FSRQs) or the absence (BL Lacs) of broad and narrow emission lines. More than three dozen blazars have been detected at very high energy, the overwhelming majority of which belong to the BL Lac class. PKS 1510-089 is a FSRQ at a redshift of z = 0.361, with a curved radio jet (top image) showing apparent superluminal motion as high as 45 times the speed of light (Holmann 2001, 2002). 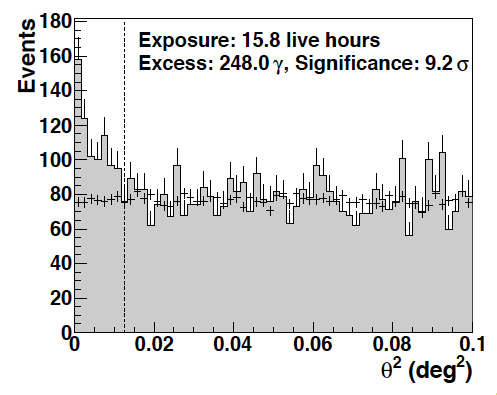 Following reports in March, 2009 of flaring activity in PKS 1510-089 in the high energy domain (D’Ammando et al. 2009; Pucella et al. 2009; Vercellone et al. 2009; see also Abdo et al. 2010) as well as in the optical frequencies recorded with the ATOM telescope on the H.E.S.S. site, PKS 1510-089 was observed with the H.E.S.S. telescope array between MJD54910 (March 20, 2009) and MJD54923 (April 2). Subsequent observations were obtained between MJD54948 (April 27) and MJD54950 (April 29) after another HE flare was reported. A total of 15.8 hours of data passing quality cuts were obtained from all observations. An excess of 248 gamma-ray candidates was recorded from the source direction (Fig. 1), which corresponds to a firm detection with a statistical significance of over 9 standard deviations (Fig. 2). As expected for the large redshift, the spectrum of gamma rays is quite steep, with the flux at higher energies strongly attenuated by interactions with extragalactic background light, resulting in production of electron-positron pairs (see also SOM Dec. 2005). The H.E.S.S. data set does not show variability at a statistically significant level. 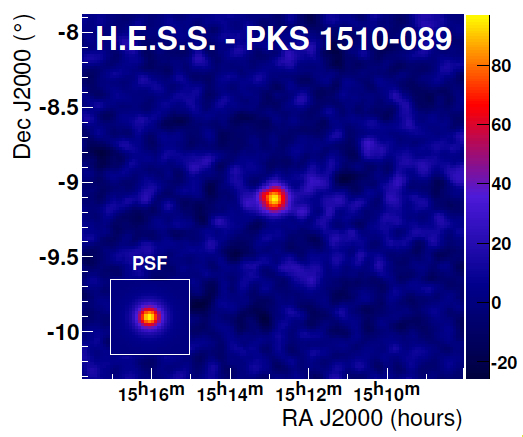 However, the >200 MeV gamma ray flux from Fermi-LAT clearly demonstrate the flaring activity which triggered H.E.S.S. observations (Fig. 3), with the H.E.S.S. data taken near flux peaks. The PKS 1510-089 data will help constraining the optical depth of the Universe for very high energy gamma rays, and hence the level of extragalactic background light. Fig. 1: H.E.S.S. 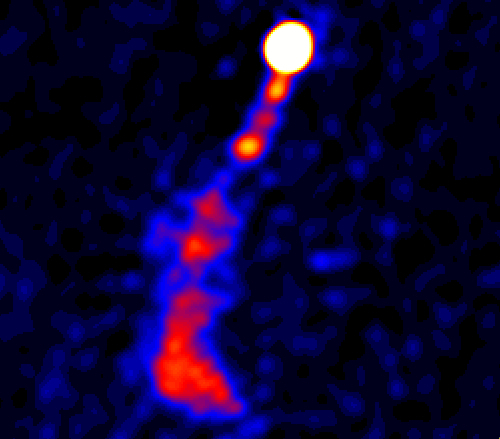 gamma ray sky map of the field around the position of PKS 1510-089, with slight smoothing applied. The inset shows the point spread function, i.e. the response to a point source of gamma rays. Fig. 2: The distribution in the angular distance between the source position and the reconstructed arrival direction. On-source (signal+background) events are shown as filled histogram, while the off-source (background) events are shown as points with error bars. Fig. 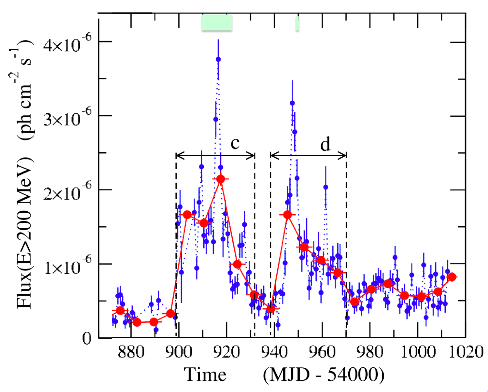 3: Light curve measured above 200 MeV with the Fermi LAT (Abdo et al. 2010). The periods where the H.E.S.S. data were taken are shown as green bars.